Shelbya Jean Lawrence, 79 of Lake St. Louis MO, died peacefully at her home on March 13, 2019, surrounded by her loving family. She and Jack lived in various parts of Illinois and St. Louis, all the while parenting their children. Shelbya was involved in many church, sports and music activities with her children, in addition, working as an accomplished seamstress. As the children became teenagers, Shelbya worked as the foreign language department secretary at Parkway West High school. Throughout these years, she developed many lifelong friends. During the mid-1970’s when Jack entered the Seminary, Shelbya began a new chapter in her life supporting and sharing in Jack’s call to their ministry in the Lutheran Church. 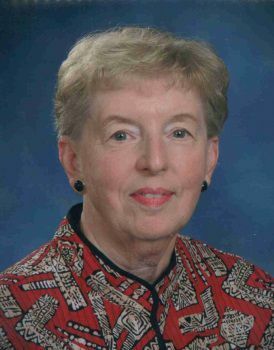 She and Jack served congregations in St. Louis, Pennsylvania, and Illinois until Jack’s passing in 2005. One of her greatest joys, besides her enjoyment playing golf, reading and watching University of Illinois Basketball, was being a SSM Hospice volunteer, in the St. Charles County area, all the way up to her final year when she was diagnosed with cancer. Shelbya lived her life by example of her Christian faith, quiet determination with great love for her family and friends. Visitation and services were held March 18, at at Living Lord Lutheran Church, 500 Cedar Circle Drive, Lake St. Louis, MO and a Graveside Service was held at Beckman Cemetery, in Rantoul Township, IL for her extended family and friends in IL.